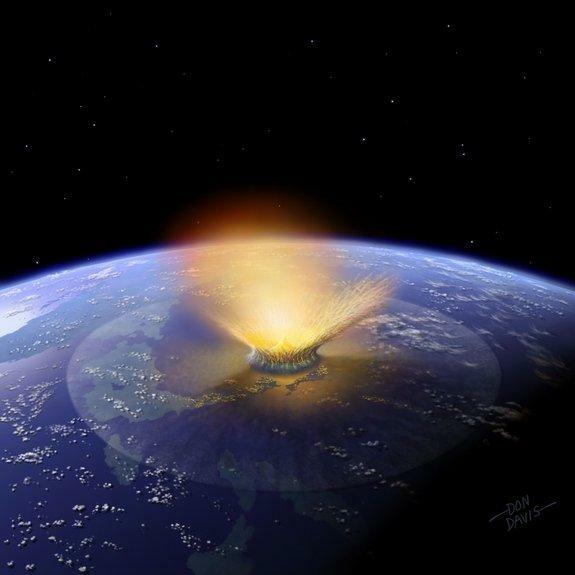 The most popular theory today is that a giant asteroid hit the earth, causing dramatic climactic change (though not even a clear majority of paleontologists support this theory). Some believe this resulted in a “deep freeze” with a blanket of dust darkening the globe for months or even years. While this certainly could have wiped out the dinosaurs; how come insects, flowering and freshwater plants, and other more susceptible organisms did not become extinct? Others suggest that the great reptiles were killed because the asteroid’s fiery embers ignited a worldwide firestorm that burned them up. But how could every dinosaur have been destroyed by this cataclysm and yet thin-skinned mammals, delicate birds, and lizards have survived? The primary evidence for this great collision comes from certain types of clay with metal called iridium in them. Asteroids have this element, as does the earth’s core. Could some of these deposits be evidence of large volcanic eruptions of iridium in the past? The Flood would have caused the greatest earthquakes and volcanic eruptions ever known. In April of 2009 a mainstream geologist challenged the conventional belief that all dinosaurs went extinct by the end of the Cretaceous period. 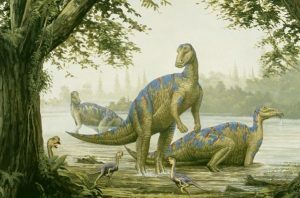 Jim Fassett, a paleontologist who holds an emeritus position at the U. S. Geological Survey, published a paper in Palaeontologia Electronica producing fossil evidence that points to a pocket of dinosaurs that somehow survived in remote parts of New Mexico and Colorado and made it into the Paleocene Age. For the creationists, the answer is simple. 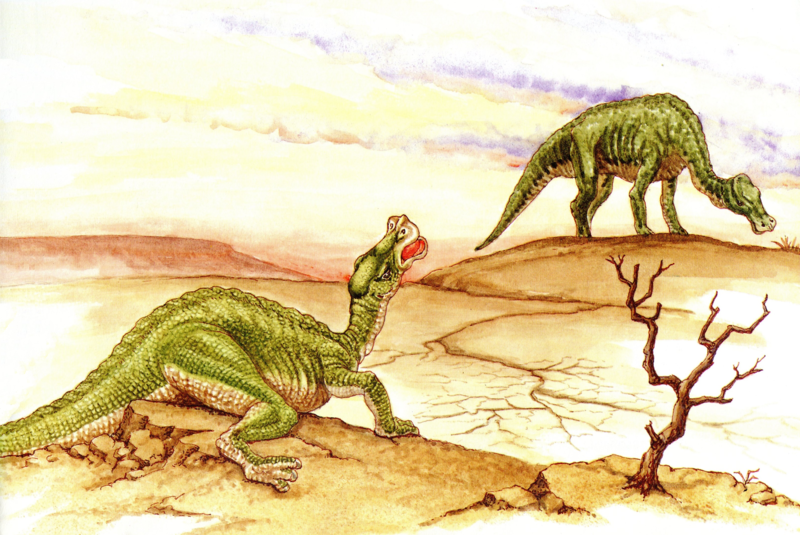 The conditions of the early earth were ideal for dinosaurs to spread around the globe. The dinosaur bones that we discover fossilized today were laid down by the Genesis Flood. Indeed the Dinosaur Death Poses provide strong evidence that they died from asphyxiation. After the Flood, the descendants of the representative mating pairs that were preserved on the ark survived in smaller populations. 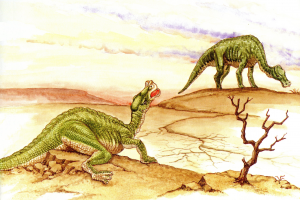 As other populations flourished, many dinosaur species would have succumbed to the harsher environment. Those kinds that did not become extinct in the centuries after the Flood were hunted down as a threat or were killed for food so that only a few still survive today in very remote areas. This view is supported by the evidence presented on the Genesis Park website, including extant dinosaurian creatures in remote regions, soft tissue remains in dinosaur bones still, depictions of dinosaurs by ancient civilizations, and reports of dragons throughout history. ← Previous: Dinosaurs Evolved Into Birds?